Machine learning techniques are increasingly being used to address problems in computational biology and bioinformatics. Novel computational techniques to analyze high throughput data in the form of sequences, gene and protein expressions, pathways, and images are becoming vital for understanding diseases and future drug discovery. Machine learning techniques such as Markov models, support vector machines, neural networks, and graphical models have been successful in analyzing life science data because of their capabilities in handling randomness and uncertainty of data noise and in generalization. From an internationally recognized panel of prominent researchers in the field, Machine Learning in Bioinformatics compiles recent approaches in machine learning methods and their applications in addressing contemporary problems in bioinformatics. Coverage includes: feature selection for genomic and proteomic data mining; comparing variable selection methods in gene selection and classification of microarray data; fuzzy gene mining; sequence-based prediction of residue-level properties in proteins; probabilistic methods for long-range features in biosequences; and much more. Machine Learning in Bioinformatics is an indispensable resource for computer scientists, engineers, biologists, mathematicians, researchers, clinicians, physicians, and medical informaticists. 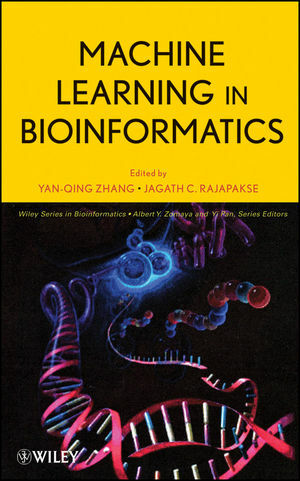 It is also a valuable reference text for computer science, engineering, and biology courses at the upper undergraduate and graduate levels. Yan-Qing Zhang, PhD, is an Associate Professor of Computer Science at the Georgia State University, Atlanta. His research interests include hybrid intelligent systems, neural networks, fuzzy logic, evolutionary computation, Yin-Yang computation, granular computing, kernel machines, bioinformatics, medical informatics, computational Web Intelligence, data mining, and knowledge discovery. He has coauthored two books, and edited one book and two IEEE proceedings. He is program co-chair of the IEEE 7th International Conference on Bioinformatics & Bioengineering (IEEE BIBE 2007) and 2006 IEEE International Conference on Granular Computing (IEEE-GrC2006). Jagath C. Rajapakse, PhD, is Professor of Computer Engineering and Director of the BioInformatics Research Centre, Nanyang Technological University. He is also Visiting Professor in the Department of Biological Engineering, Massachusetts Institute of Technology. He completed his MS and PhD degrees in electrical and computer engineering at University at Buffalo, State University of New York. Professor Rajapakse has published over 210 peer-reviewed research articles in the areas of neuroinformatics and bioinformatics. He serves as Associate Editor for IEEE Transactions on Medical Imaging and IEEE/ACM Transactions on Computational Biology and Bioinformatics. 1 Feature Selection for Genomic and Proteomic Data Mining (Sun-Yuan Kung and Man-Wai Mak). 2 Comparing and Visualizing Gene Selection and Classification Methods for Microarray Data (Rajiv S. Menjoge and Roy E. Welsch). 3 Adaptive Kernel Classifiers Via Matrix Decomposition Updating for Biological Data Analysis (Hyunsoo Kim and Haesun Park). 4 Bootstrapping Consistency Method for Optimal Gene Selection from Microarray Gene Expression Data for Classification Problems (Shaoning Pang, Ilkka Havukkala, Yingjie Hu, and Nikola Kasabov). 5 Fuzzy Gene Mining: A Fuzzy-Based Framework for Cancer Microarray Data Analysis (Zhenyu Wang and Vasile Palade). 6 Feature Selection for Ensemble Learning and Its Application (Guo-Zheng Li and Jack Y. Yang). 7 Sequence-Based Prediction of Residue-Level Properties in Proteins (Shandar Ahmad, Yemlembam Hemjit Singh, Marcos J. Araúzo-Bravo, and Akinori Sarai). 8 Consensus Approaches to Protein Structure Prediction (Dongbo Bu, ShuaiCheng Li, Xin Gao, Libo Yu, Jinbo Xu, and Ming Li). 9 Kernel Methods in Protein Structure Prediction (Jayavardhana Gubbi, Alistair Shilton, and Marimuthu Palaniswami). 10 Evolutionary Granular Kernel Trees for Protein Subcellular Location Prediction (Bo Jin and Yan-Qing Zhang). 11 Probabilistic Models for Long-Range Features in Biosequences (Li Liao). 12 Neighborhood Profile Search for Motif Refinement (Chandan K. Reddy, Yao-Chung Weng, and Hsiao-Dong Chiang). 13 Markov/Neural Model for Eukaryotic Promoter Recognition (Jagath C. Rajapakse and Sy Loi Ho). 14 Eukaryotic Promoter Detection Based on Word and Sequence Feature Selection and Combination (Xudong Xie, Shuanhu Wu, and Hong Yan). 15 Feature Characterization and Testing of Bidirectional Promoters in the Human Genome—Significance and Applications in Human Genome Research (Mary Q. Yang, David C. King, and Laura L. Elnitski). 16 Supervised Learning Methods for MicroRNA Studies (Byoung-Tak Zhang and Jin-Wu Nam). 17 Machine Learning for Computational Haplotype Analysis (Phil H. Lee and Hagit Shatkay). 18 Machine Learning Applications in SNP–Disease Association Study (Pritam Chanda, Aidong Zhang, and Murali Ramanathan). 19 Nanopore Cheminformatics-Based Studies of Individual Molecular Interactions (Stephen Winters-Hilt). 20 An Information Fusion Framework for Biomedical Informatics (Srivatsava R. Ganta, Anand Narasimhamurthy, Jyotsna Kasturi, and Raj Acharya).